Is This The Best Snow Blower For You? This is Craftsman’s biggest snow thrower! At first look it appears just like the Troy-Bilt and Cub Cadet 45 in snow throwers but there are some subtle differences. The Craftsman 88398 has drift cutters, sealed, maintenance free ball bearings, stronger than steel poly skid shoes and is serviced right at your home by Sears Home Services. You never have to take your Craftsman anywhere to get it repaired . This Craftsman is designed for anyone that needs to clean a very large driveway or large, wide sidewalks. This snow thrower features heated hand grips, huge capacity, large deep tread tires, big motor, power steering and electric start. It handles not only the heavy, wet snow on your driveway but also clear the piles of snow left by your snow plow or ATV. This is a specialty snowblower and I normally don’t recommend this snow thrower because of it’s size. It is too large for most of you. It works best for large flat areas like parking lots, city sidewalks, school sidewalks and three car driveways. Don’t buy this if you have a steep incline to clear. Don’t buy this if your sidewalk is less than 45 inches wide. Even though it weighs almost 500 lbs and has dual wheels ….. it has has traction issues on steep driveways and sidewalks. WHAT SIZE DRIVEWAY WILL YOU BE CLEARING? (Small, Medium, Large, Extra Large) This snow thrower is large enough to handle any size of driveway, parking lot or sidewalk complex. There is no larger walk-behind snow blower on the market. WHAT TYPE OF SNOW DO YOU TYPICALLY GET? (Powdery, Light, Moderate, Wet & Heavy.) This is Craftsman’s largest capacity snow thrower. It will handle all types of snow well. WHAT TYPE OF SURFACE WILL YOU BE CLEARING? (Paved, Gravel, Patio, Deck, Turf.) The Craftsman 88398 has Polymere rust-resistant, non-marking, reversible skid shoes. These non-marring shoes are the tougher than steel, yet they won’t scratch your patio or leave brown rust marks on your cement sidewalks and driveways. If you do manage to wear them out they are reversible to give your double the life over steel skid shoes. HOW MUCH SNOW DO YOU NEED TO CLEAR PER SNOWFALL? (Less than 3″, 3″-6″, 6″-9″, More than 9″) The 22 inch intake height will let you power through most drifts. Tool-less drift cutters let you cut cleanly through deeper drifts. 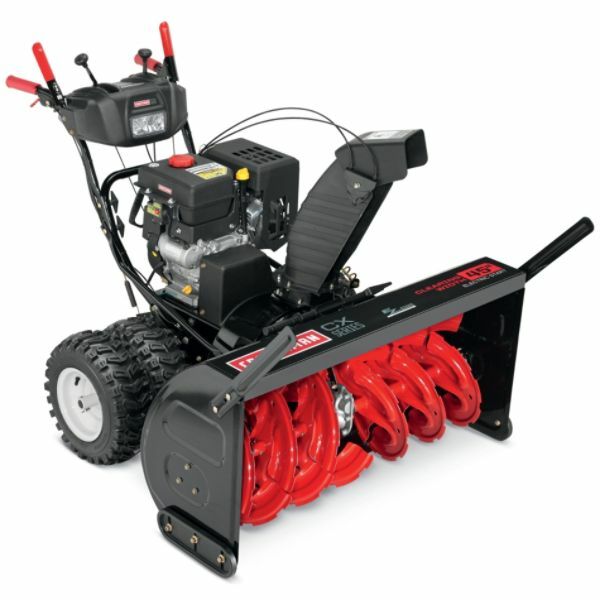 This snow thrower will handle 20 inch snow falls easily. Buy Here Craftsman 88398 at Sears! What you may not like: This snowblower is big and heavy! It will not work well for you if you have to go over more than a step or two. Even though it is a big snow thrower it is very easy to use and balanced well. Don’t buy this if you have a steep incline to clear. Again, don’t buy this if your sidewalk is less than 45 inches wide. Even though it weighs almost 500 lbs and has dual wheels ….. it has has traction issues on steep driveways and sidewalks. Click Here for Craftsman 88398 at Sears! Is This One Of The Best Rated Snow Blowers for 2013? Mechanically this Craftsman 88398 snow thrower is rated well and has no maintenance issues, but there are some reviews out there complaining about traction. If you need to clear large areas like city sidewalks, school walkways or huge, flat residential driveways don’t be afraid to buy this machine. The snow blower itself has been around for many years. The engine is only 3 years old but it is developing one of the best service records around. It has six shear pins in the auger so if you do hit something they break instead of damaging the gearbox. Does This Get a Best Snow Blower Rating For 2013? In the Good, Better, Best rating system this snow blower rates a “Best” for ease of use, durability and long life. Power Steering, remote chute, electric start, large engine all factor into this “best” rating. It uses a strong Craftsman motor that has plenty of power for it’s 45 inch size. In fact the motor is one of the most dependable on the market today. The huge 16 in impeller and discharge chute move snow well and don’t clog when blowing wet, heavy snow. Is This One Of The Best Snow Blowers for the Money 2013? I normally don’t give you my opinion, but if you need a snow blower this large the price is reasonable. Value: At around $2300 it is a good value for the size. You get many “creature comfort” features for the money with this snow blower. Click here for the parts you should have at your home! Featuring a brawny 420cc engine, the Craftsman 45″ Dual-Stage Gas Snow Blower is built for heavy-duty use. Extra wide 45-inch clearing width means your driveway will be clear in minutes. The deluxe Glide-Tech skid shoes slide over pavers and bricks smoothly ensuring damage-free performance. Features like plow style handles, EZ Steer system, heated hand grips and push-button electric start make snow removal a breeze. Dual 16″ x 6.5″ X-Trac tires in this 45″ Dual-Stage Gas Snow Blower offer greater traction in slippery snow terrains. In-dash LED headlight sheds a glow on your clearing path, enhancing visibility for added safety. Watch in amazement as the tool-less drift cutters knife through hard-packed, icy snow drifts, making it easier to power your way through and efficiently clear them. Park this potent snow thrower in your garage reassured that the patented deluxe Glide-Tech skid shoes will eliminate the chance of rust stains.